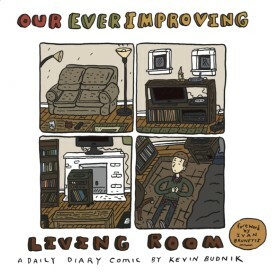 Kevin Budnik’s diary comic Our Ever Improving Living Room began life in 2010 as a college course exercise. Using a narrative structure familiar to fans of James Kochalka’s American Elf, Budnik produced a four-panel strip every day for a year and a day chronicling events from his life. 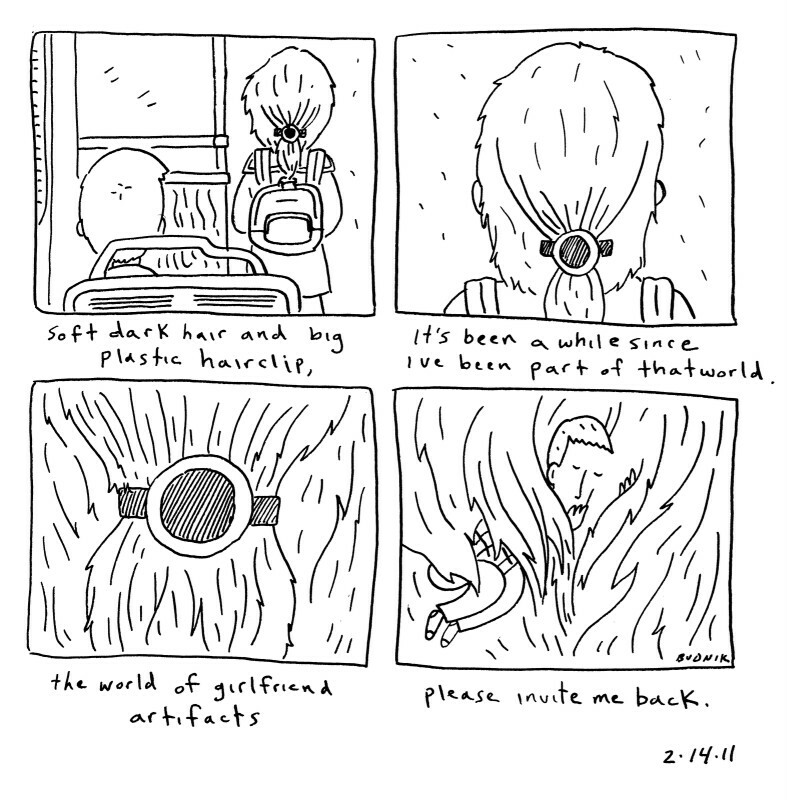 As befits any good autobio comics project these windows into his daily existence depict everything from the trivial and the seemingly throwaway, to the profound and the momentous. Let’s clear the pachyderm out of our living quarters first. Yes, there are indeed obvious comparisons to be made to the work of Kochalka here both in terms of content and presentation. 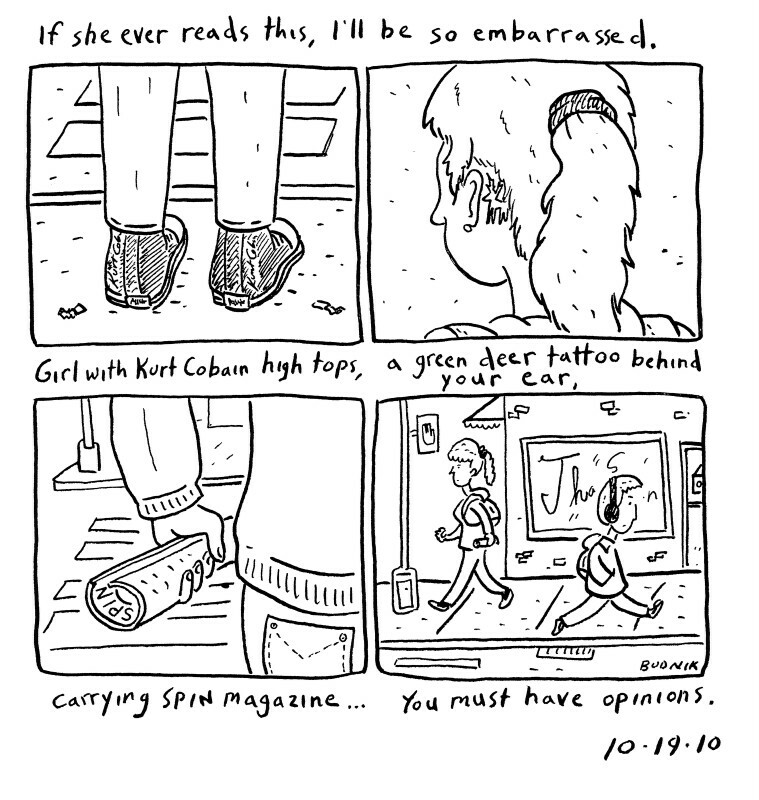 However, after some initial trepidation in the early strips Budnik is quick to find his own creative voice, projecting an acutely self-deprecating persona; a kind of vulnerable everyman we can both root for and empathise with. One of Budnik’s great strengths as a slice-of-life writer is his realisation from the outset that the diary strand of comics storytelling is as much about the importance we invest in life’s inconsequentialities as it is in those pivotal events. Both, after all, define us in their own significant ways. As such, the material on offer here can range from Budnik’s quiet reflections on tragic news stories to his droll observations on human foibles, through to self-critical humour and dreamy flights of fancy. At times his wit is quite brilliantly absurd: flies taunting him for poor hygiene, or considering gender realignment to become a roller derby girl, for example. Sometimes there’s a poignancy to the work that’s almost overwhelming: pondering on the impermanence of a loved home or self-destructive feelings in the subway. 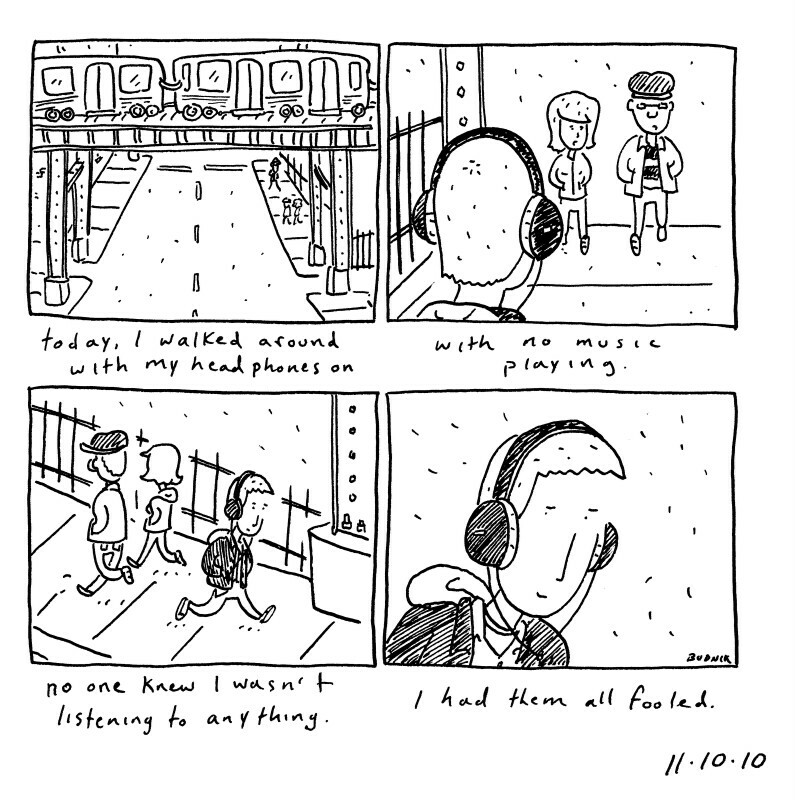 And on other occasions you’ll find yourself nodding in recognition at some of Budnik’s little idiosyncrasies; musings on quirks that you though only applied to you like finding yourself pulling out your keys instead of your train ticket at station exits or feeling slyly superior for having your headphones on all day and avoiding contact with people even though you’re not actually listening to anything. 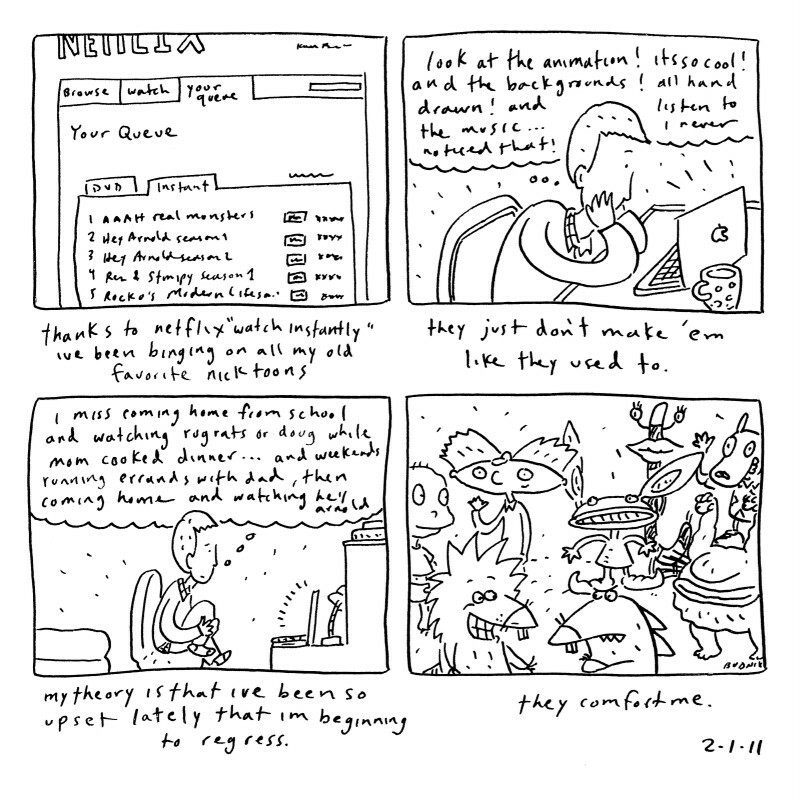 As I’ve said on many occasions before here in ‘Small Pressganged’, autobiographical small press books are a genre for which I have a particular fondness. 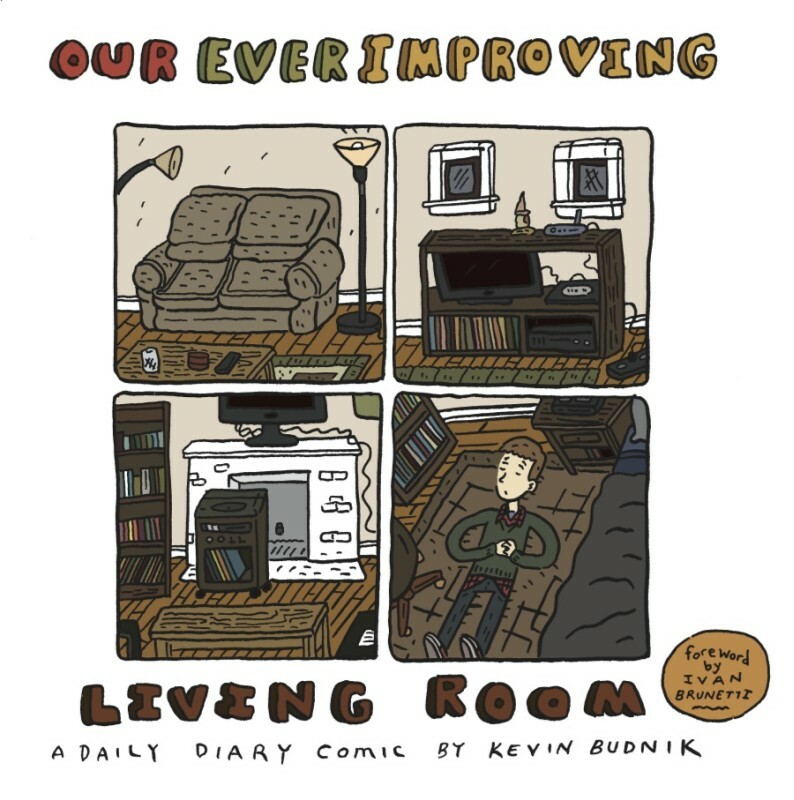 The clarity of Kevin Budnik’s expressive cartooning style and his often raw honesty makes Our Ever Improving Living Room an engaging and hugely likeable read, and the rigid storytelling structure that he sets himself here means that there’s a discipline to the scattered, isolated episodes from his life that makes this an even more impressive debut work. 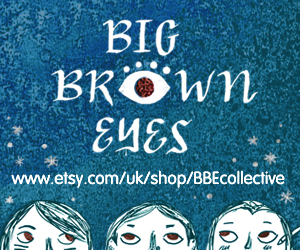 For a second time this week I’m suggesting you bookmark the site of a newer creator, and while you’re at it why not do the same for Yeti Press because this project is a further testament to the eclectic output of the Chicago micro-publisher. You can also check out Our Ever Improving Living Room online here. 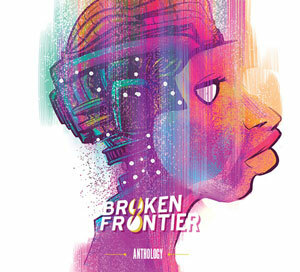 The book is published by Yeti Press priced $20.00 and is available from their online store here.